What Planet Did OFIS' Crazy Spaceship Football Stadium Come From? What Planet Did OFIS’ Crazy Spaceship Football Stadium Come From? 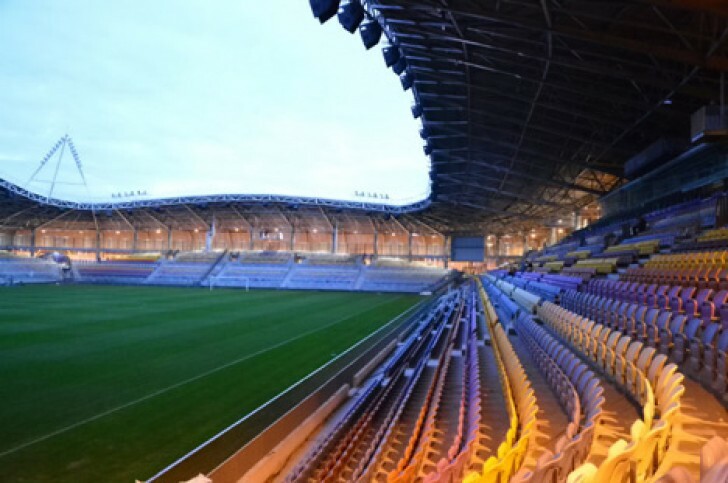 Slovenian architectural firm OFIS Arhitekti has nearly completed construction on a spaceship stadium for local football team FC Bate Borisov in Belarus. Clad in a glistening aluminium shell and covered with irregular shaped cutouts, the so-called "Spotty Stadium" is a futuristic rendition of modern stadium design. According to the architects, the unique exterior is intended to resemble a perforated cloth stretched over the building's low, elliptical skeleton. Although the exterior of the stadium is certainly eye-catching thanks to the assortment of blob-shaped holes that cover the building, the building’s unique design is more than just aesthetic. By using an acute oval design and covering the shell with perforations, the architects aim to provide an optimal acoustic environment during football games and other events such as concerts. The new stadium classified as 4 stars under UEFA and slated to be completed at the end of the year, will hold 13,000 seats, 620 VIP seats, press cabins and an expansive 3,000 square meters of public space. Could it usher in a new ear of futuristic stadium design? 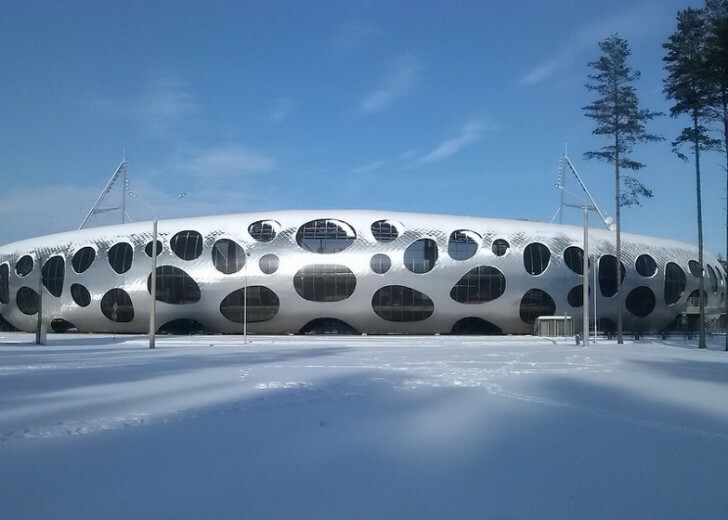 Although the exterior of the stadium is certainly eye-catching thanks to the assortment of blob-shaped holes that cover the building, the building's unique design is more than just aesthetic. By using an acute oval design and covering the shell with perforations, the architects aim to provide an optimal level of acoustics during football games and other events such as concerts. The new stadium classified as 4 stars under UEFA and slated to be completed at the end of the year, will hold 13,000 seats, 620 VIP seats, press cabins and an expansive 3,000 square meters of public space. Throughout construction, the architects aimed to keep as many existing trees on site as possible. The stadium's playing surface has a total area of 85 x 105m. The new stadium also includes a restaurant and bowling area as well as public fitness studios.